Mmmm…. So creamy… so vegany. I made this recipe for a table of 12 non-vegans, and they all loved and devoured it. 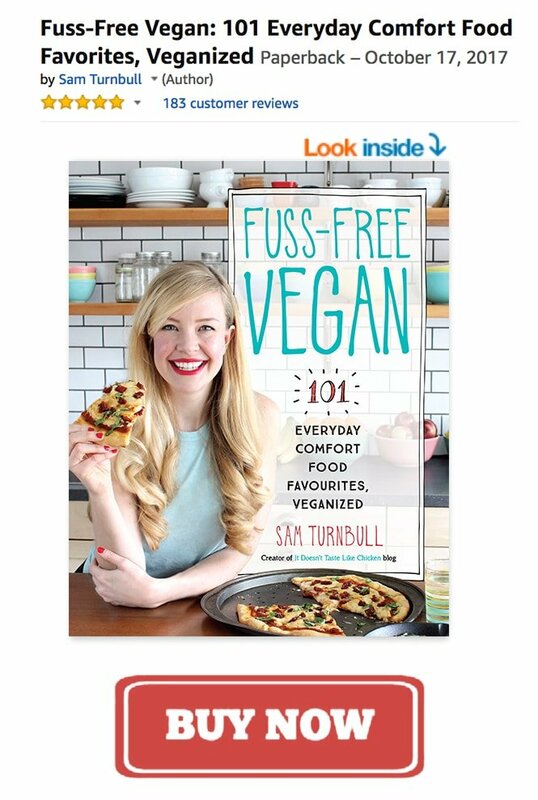 Non-vegan approved! The wonderful thing about risotto is, you really don’t need the mounds of cheese or butter to make the dish creamy. It magically does that all on it’s own. 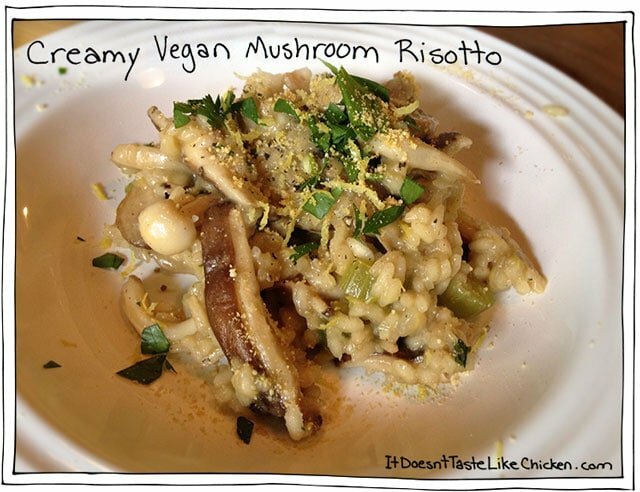 Try this Creamy Vegan Mushroom Risotto and see for yourself! 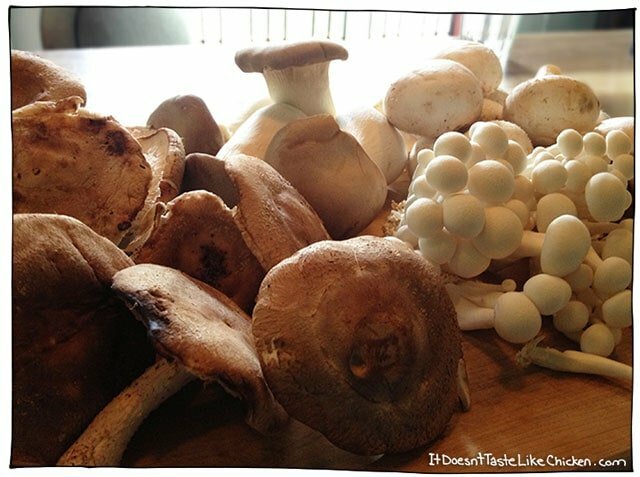 I chose 4 different kinds of mushrooms, shiitake, king oyster, button, and enoki mushrooms. If you have different varieties available those will do as well, or even if you only have regular old button mushrooms and nothing else, this recipe will still work out. The most important part is to have lots of mushroom! They cook down a lot! To start, pour all your veggie broth in a sauce pan, and heat it up to a simmer on the stove. You will leave this simmering the whole time as you use it. 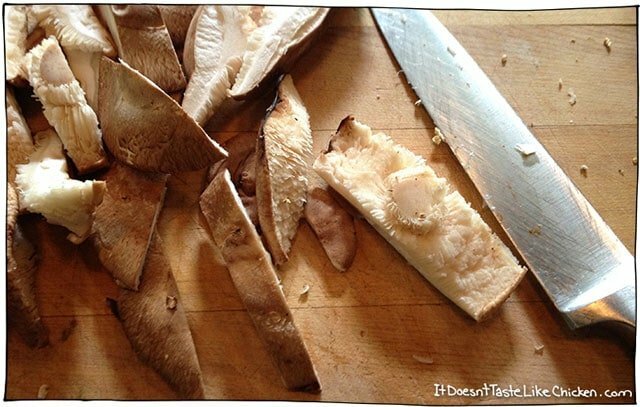 Chop up your mushrooms, remove stems if need be. Sauté the mushrooms in a bit of oil. You will have to do this in batches, so that they have a chance to brown. Don’t crowd the mushrooms. I did 4 batches (but I also made this for 12, so you may have fewer). Each time you finish a batch, dump them out of the pan into a bowl and set aside. 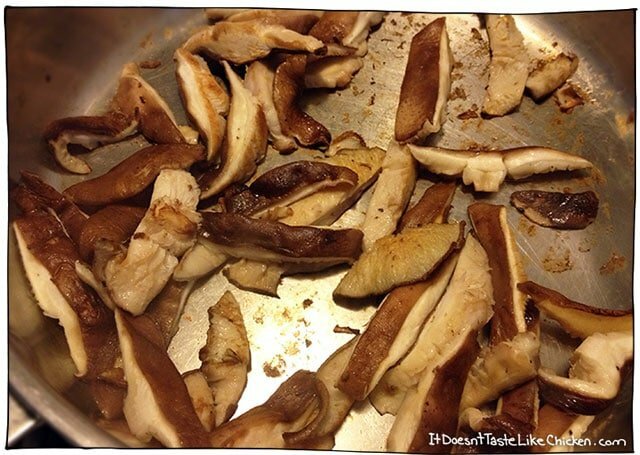 Add a bit more oil to the pan and move onto the next batch of mushrooms. Once finished with the mushrooms, chop up some celery and onions and sauté that in the same pan you just had the mushrooms in. Don’t worry about all the brown bits left on the bottom of the pan from the mushrooms, those are delicious flavour bits, and they will work their magic in the risotto. 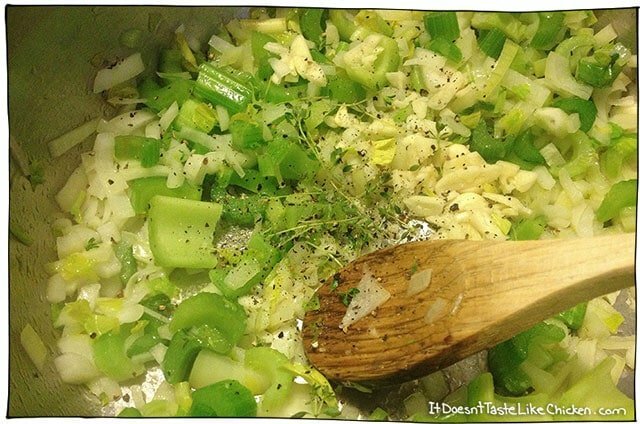 When the onions start to golden, toss in the garlic, thyme, and some salt and pepper. When that is looking all delicious add your rice. About 1/2 cup of rice is good for one person, this recipe is roughly for four, so toss in around two cups. (I don’t bother to measure). Now comes the non-stop stirring part of the recipe. 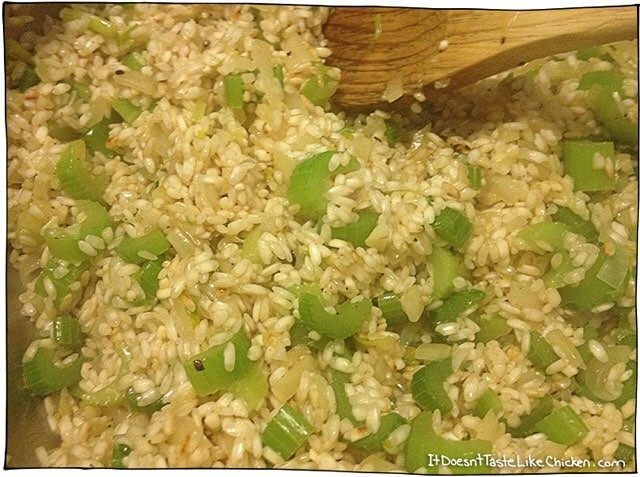 You want your rice to soak up some of the onion celery juice, but it is important not to brown the rice! So keep moving it! 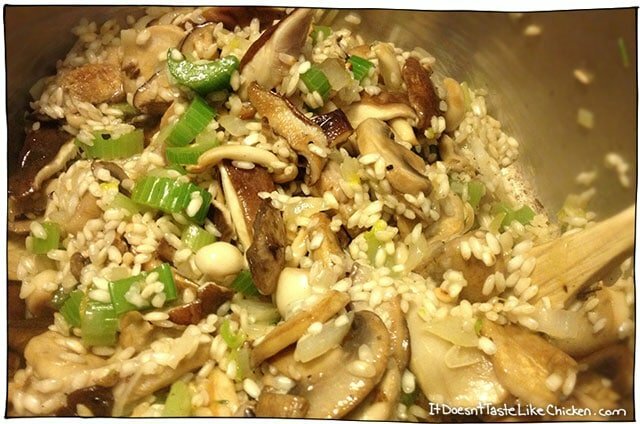 Do this for about 1-2 minutes and the rice will start looking a bit translucent. Now add your splash of white wine or vermouth, and let that absorb into the rice. Then, take a ladle-full of your broth and add it to your rice. Keep it moving. The broth will begin to be sucked up by the rice. Once it is all sucked up, add all your mushrooms, and another ladle-full of broth. Keep stirring. Once broth is absorbed add more. Do this until the rice is cooked. About 15-20 mins. If you run out of broth, just use a bit of water. It will start looking all creamy and delicious. Have a taste and when it is al dente it is done. Now all you have to do is season with nutritional yeast, chili powder, vegan butter, salt, pepper, and lemon juice. Taste and adjust as you like. Garnish with the lemon zest, chopped parsley, and a sprinkle of parmegan. 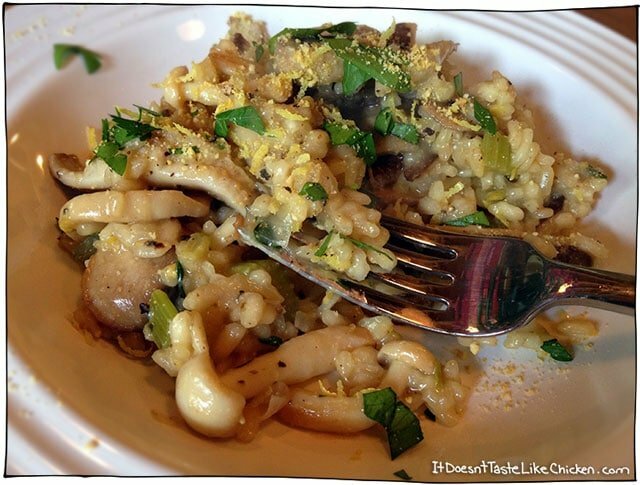 This is one of my most favorite risotto recipes ever!!! Super creamy without any dairy! I’m recently going vegan so this was a surprise to me. LOVE LOVE LOVE it!!!! It will definitely be made multiple times in my house!!! Thank you!!! Time to redo this one… PLEASE! I’m so NOT good with measurement guesstimates. But this dish sounds AWESOME. I love your measurement guesstimates-this is exactly how I cook. It’s stressful to have to measure every little thing, so I enjoy recipes where I can get the gist of what to do. Trying this tonight-already have the ingredients prepped. Thanks! Haha! Amazing! Yes, it’s how I cook, an how I was taught to cook! Cooking shouldn’t be intimidating, it’s just food! haha! Enjoy the risotto! oh this looks sooo good! I am going to have to make this!